1. First, pat the racks dry with kitchen paper and cut down between the bones, but not all the way through. 2. Rub the salt & pepper all over the racks. 3. Combine the garlic, lemon juice, oil and chilli and brush the mixture over the racks. 4. Cover with foil and leave to marinade in the fridge. 5. Now prepare the BBQ glaze by combining the Ketchup, Worcestershire Sauce, Honey and Tabasco to taste. Set aside. Before you cook the racks, allow them to come to room temperature. 6. Barbecue the racks on a gas or charcoal grill over a medium heat for approx. 60-90 minutes. During the last 15-20 minutes, regularly brush the glaze onto the ribs (e.g. every 4 or 5 minutes). 7. Once cooked, remove from the grill and cover with foil. 8. Leave in a warm place to rest for 10-15 minutes before serving. 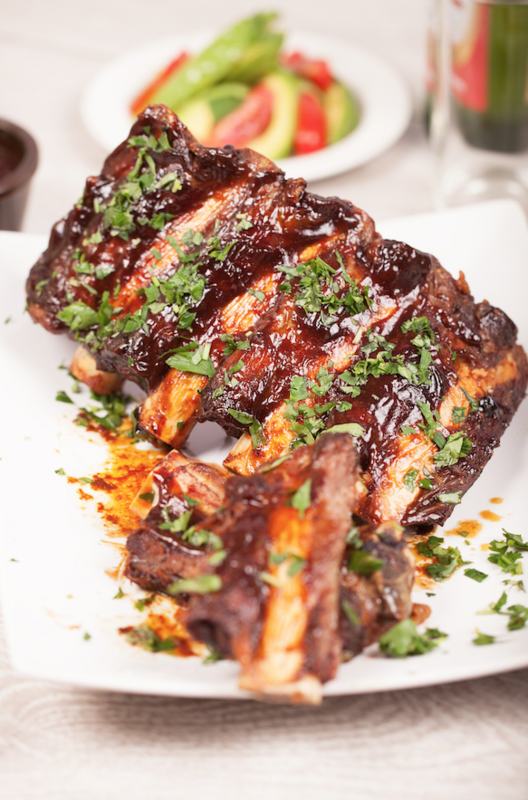 Chef’s tip: If the weather is too bad for a BBQ, you can cook the ribs in an oven instead. Cook at 180°C/350°F/Gas 4 for 60-75 minutes, and brush the glaze onto the ribs during the last 15-20 minutes as above.